Duane Hanson and Robert Gober are two highly acclaimed American artists who both use the concept of realism as points of focus in their sculpture. 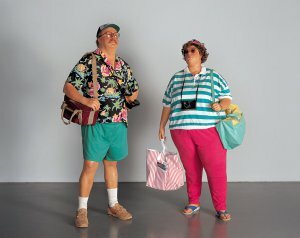 Duane Hanson created sculptures so realistic that they have often been mistaken for real people. Often featuring as models individuals who are off the beaten path, Hanson has created sculptures of tourists, museum guards, and custodians. Robert Gober uses objects familiar to the viewer to create surrealistic installations. Using objects such as sinks and human forms, Gober creates a slight twist in each object through its location or appearance. Join us as we examine the lives of these two eclectic artists. Join LHUCA and The CH Foundation for coffee and donuts!